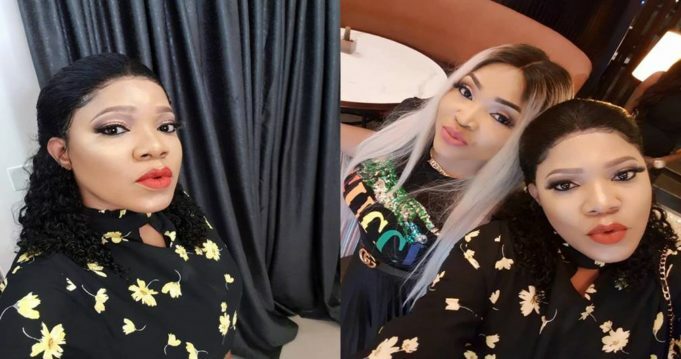 Nollywood actresses, Mercy Aigbe and Toyin Abraham who were recently at loggerheads have now ironed out their indifference. The two rivaled actresses were spotted over the weekend at the pre-birthday dinner of Nigerian male barbie, Bobrisky. The ladies took selfies and sat together to prove to fans that their dispute was indeed over. You will recall that their fight drew the attention of many after a public Instagram fight between them. Upon the Instagram war, Toyin claimed that it was a publicity stunt but after a while, the altercation brought about a split in some actors taking sides (Yomi Fabiyi and Kemi Afolabi) which finally led to the two ladies unfollowing each other. Anyway, all is fine between them now.